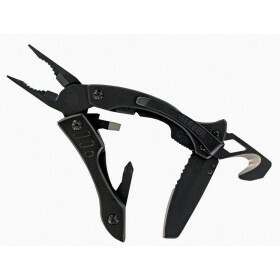 Gerber Crucial Multi-Tool (Black) » Protective Solutions, Inc. The Gerber Crucial Multi-Tool offers an entire toolbox of full-sized components in one rugged stainless steel package. The handles are ergonomically curved for a better grip and more torque. The liner-locking knife blade is half fine edge and half serrated. Built with a clip and weighing just five ounces, the Crucial can also be carried as an everyday pocket tool.